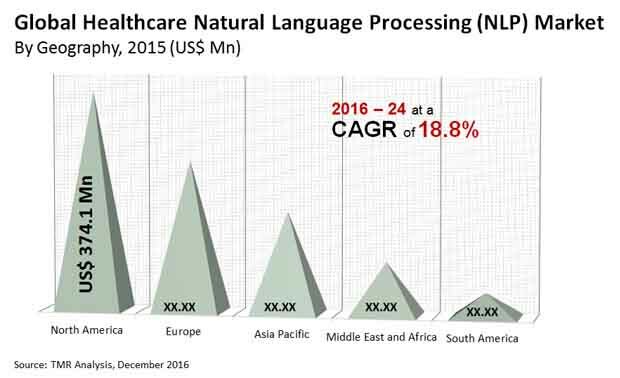 The global healthcare natural language processing (NLP) market is peculiar in itself, majorly due to the complex nature of its offerings. A report by Transparency Market Research (TMR) finds that the global market for healthcare natural language processing encapsulates a consolidated competitive landscape with a handful of strong market players. These leading market players have attained deftness with technology and execution of new plans, and this has been the prime reason behind their unchallenged position in the global healthcare NLP market. It is expected that the handful of market players in the global market for healthcare natural language processing would continually invest in research and development of better algorithms for analyzing human languages. This would create hurdles for the entities that are planning to venture into the global healthcare NLP market. The new entrants who come into the market would face several obstacles due to the high standards set by the existential market vendors. Transparency Market Research (TMR) finds that the global market for healthcare natural language processing (NLP) would expand at a starry CAGR of 18.805 from 2016 to 2024. Furthermore, the global market is projected to accumulate revenues worth US$4.3 bn by the end of 2024, rising up from a value of US$936 mn in 2015. The ability of artificial intelligence and computer sciences to interpret natural human languages has largely benefitted the healthcare industry. The use of deep learning and analytic tools to interpret medical data and improve clinical decision making has given an impetus to the growth of the global healthcare NLP market. Furthermore, the engagement of patients in the treatment process has also increased with the deployment of natural language processing within healthcare. Hence, it is safe to estimate that the demand within the global healthcare NLP market would increase alongside the rising use of clinical informatics in healthcare. Predictive analysis is another domain within healthcare that has taken a solid shape due to the emergence of natural language processing (NLP) in healthcare. Electronic health records (EHR) also hold importance for the healthcare industry, and it is easier to organize these records through the use of NLP. Hence, there are several factors that are expected to support the growth of the global market for healthcare natural language processing in the coming years. The vast number of medical concepts that need to be dealt with while deploying natural language processing in healthcare is a huge challenge to market growth. Even a slight error in processing of clinical data can have severe consequences for the healthcare industry. This is one of the major reasons behind the steady adoption of natural language processing within healthcare. Nevertheless, the rapidly advancing healthcare industry is expected to find pragmatic solutions to deal with the problem of vastly unorganized medical data. The review is based on a report by Transparency Market Research (TMR) titled “Healthcare Natural Language Processing (NLP) Market (Technology - Machine Translation, Information Extraction, Automatic Summarization, and Text and Voice Processing) - Global Industry Analysis, Size, Share, Growth, Trends and Forecast 2016 – 2024”.